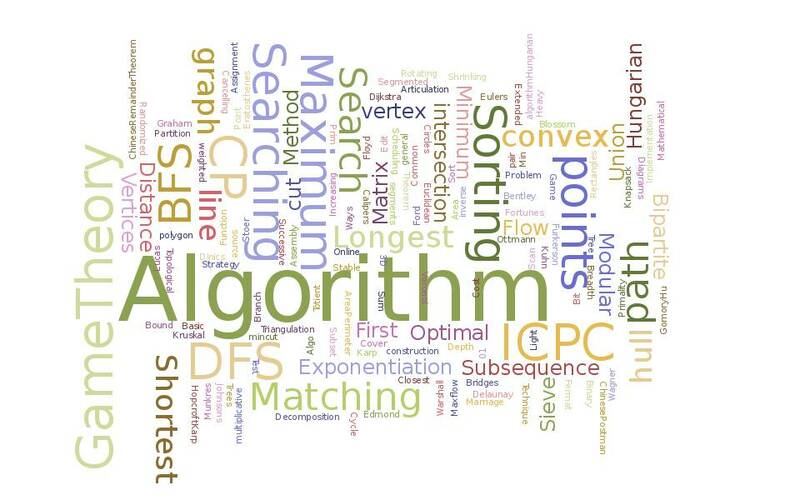 This blog post emphasize some random Gyan which may be useful for competitive programmers during coding contests. Almost every beginner use Windows but the OS preferred by veteran developers and programmers is certainly Linux as it provide a better coding experience and plethora of customization opportunities. I personally work on Ubuntu as it is one of the most popular distro with awesome community support and its package manager library apt and dpkg have almost all requisite packages for a good coding setup. You can chose any distro as they are almost similar to each other. 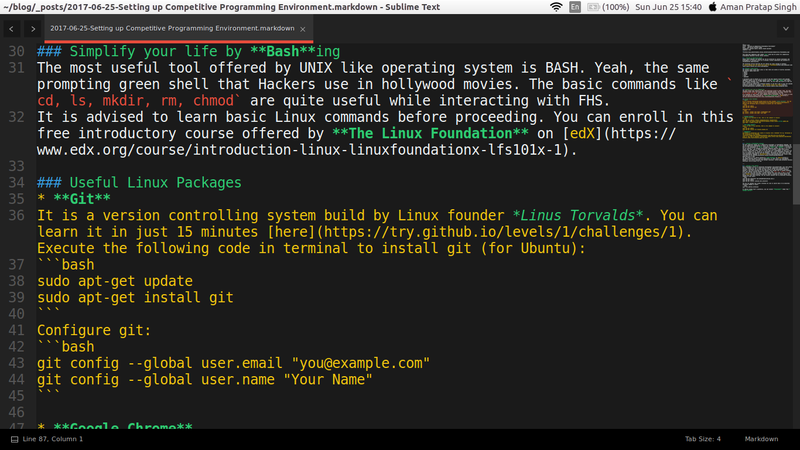 The most useful tool offered by UNIX like operating system is BASH. Yeah, the same prompting green shell that Hackers use in hollywood movies. The basic commands like cd, ls, mkdir, rm, chmod are quite handy while interacting with FHS. It is advised to learn basic Linux shell commands before proceeding. You can enroll in this free introductory course offered by The Linux Foundation on edX. This is the link of MacBuntu installation guide. The most important weapon for a competitive programmer is Programming language. You can do competitive programming in almost any language but the language preferred by most of the programmers is C++ followed by Java and Python. ACM ICPC allows only 4 languages (C/C++, Java and Python) in world finals. I personally use C++ because of its awesome STL(Standard Template Library) and also it is a bit faster than Java. Java is heavily based on OOP so even writing a simple Hello World! program require many lines. Also it is very easy for C programmers to step up on C++ as C is a subset of C++. Using C++ is advisable alongwith basic knowledge of Python as Python can be helpful while dealing with big integers. 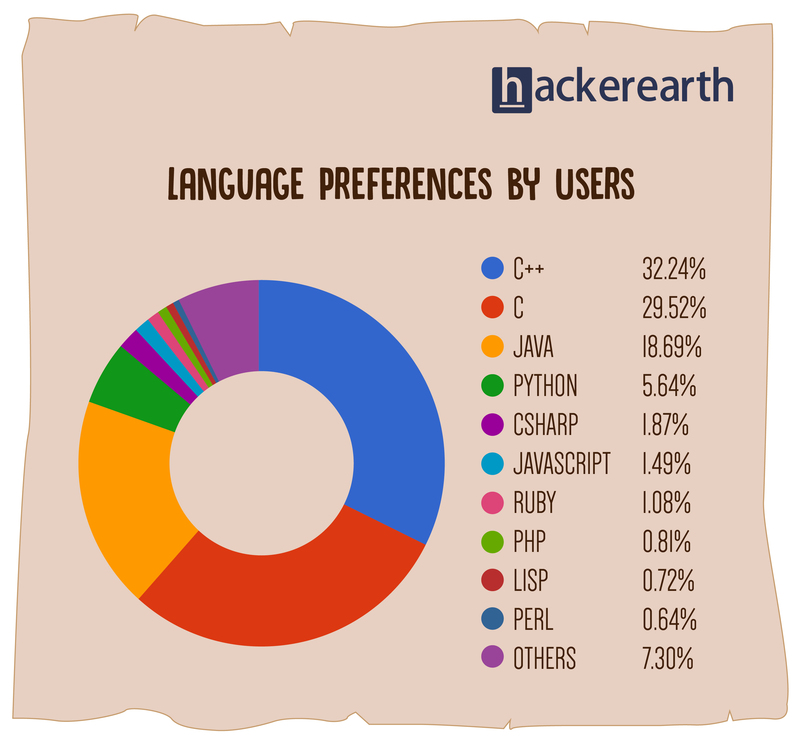 Following pie chart shows the most used programming language on Hackerearth online judge. You can enroll in C++ course offered by John Purcell on Udacity to learn basic C++ programming. However if you prefer learning from textual tutorials, http://www.cplusplus.com/doc/tutorial/ can be useful for you. The standard C++ I/O functions (cin/cout) flush the buffer on every next I/O call which unncecessarily increase I/O time. For enhancing C++ I/O speed, you can either use C’s standard I/O function (scanf/printf) instead of (cin/cout) or you can write the following lines in main function. Similarly the C++ endl also flush the buffer. You can either use C’s '\n' instead of endl or you can write the following macro in your C++ file. Get rid of those includes! To improve Subime Text’s aesthetics, you can install themes like Brogrammer from Package Control. For that you have to first install Package Control followed by Brogrammer. Using sublime without knowing its super useful shortcuts is futile. You must learn useful sublime text’s shortcuts to gear up your coding speed. Click Here for Sublime text shortcuts cheatsheet. Don’t forget to bookmark them. For a C++ programmer writing macros, typedef, including libraries etc. everytime while creating a new file can be a WET practice. So to DRY up this you can use sublime snippet feature. To create a new snippet, select Tools > Developer > New Snippet…. Sublime Text will present you with skeleton for a new snippet. Replace <!-- Your Snippet Code here --> comment with your desired snippet. Now save the file in default directory with a name like cpp.sublime-snippet. For triggering this you have to just type code + TAB in your C++ file. Notice the $0 sign in 2nd line of main function in my snippet. This $0 sign tells sublime to place the cursor here after triggering the snippet. Beside this, Sublime also has plenty other useful features, to learn them you may consider downloading this awesome book by Wes Bos. Some useful things that may save your life during your proramming journey. Suppose you stucked in an infinite loop or segmentation fault while solving a problem and you realize that your friend may help in this case. In this case sending your code to your friend on FB Messanger/Whatsapp/Hike or Emailing the code is not certainly a good idea. Here comes the sites such as pastebin, ideone which may help you by hosting the code on their server and you can share just a tiny URL to your friend. Personally I prefer the last one http://paste.ubuntu.com/ because of its Gedit like Rich Synax Highlighting, nice UX and no Login/Authentication is required. Also the sharing link of Ubuntu Paste’s is much shorter than other. Cloud9 combines a powerful online code editor with a full Ubuntu workspace in the cloud. Cloud9 supports more than 40 languages. This may be useful when you have to code and you don’t have your laptop around. This service provide you an IDE in your browser which require only good internet connection. It also provide many other features like workspace sharing, simultaneous coding, built-in terminal, awesome debugger and much more. You can create one private workspace and unlimited public workspace with a free account. For knowing more about Cloud9, Visit https://c9.io. Markdown is a markup language like HTML. Learning it may not be important but it may be useful in writing rich comments. Some online judges like Codechef support writing comments with markdown. Also it is an important tool while writing documentation of your code (which probably you’ll never do in competitive programming). Markdown is quite useful in web development. This blog post is also written in markdown. You can learn basic markdown here, You should also bookmark markdown cheatsheet for your future reference. Shell scripting can be useful for automating repetitive stuff. For eg. I created following script for my cloud9 IDE, which on executing ask for a problem code and create a new C++ file. # Navigate to the folder in which the file has to be created. # Ask for Program code. # path is variable storing absolute file path. You can also find this script in my Github repository. Visit this awesome tutorial for learning shell scripting. You can comment below any doubt / criticism or compliment. Also if you like this post please share it among your hacker friends. Don’t forget to bookmark my blog and keep visiting frequently. Bonne journee!